There are currently 202 people online. 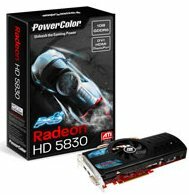 PowerColor introduced the PCS+ Radeon HD 5830, this model is factory overclocked to 825MHz core and 1050MHz memory, a slightly increase of 25MHz and 50MHz, respectively. Taipei, Taiwan –February 25, 2010 -- TUL Corporation, a leading manufacturer of AMD graphics cards, announced a factory overclocked graphics solution addition to the HD5000 series: the PowerColor PCS+ HD5830. The newest addition fills the market demand for great performance at a reasonable price. The new HD5830 embraces the PCS+ series, equipped with superior factory overclocked ability that clocks in at 825MHz core / 1050MHz memory speed, delivering the immersive gaming performance. The PCS+ HD5830 also features a superior silent and efficient cooling solution. With a 92mm ultra cooling fan and 4 pure core heat pipes, this special cooling design can easily dissipate heat from its cooper base that fully covers the GPU in a lower fan speed, efficiently cools down the temperature in a silent setting. PowerColor PCS+ HD5830 supports Microsoft DirectX® 11 technology, delivering the ultimate gaming and Windows 7® experience. With HDMI / Display Port / DVI output, this model enables ATI Eyefinity technology, allowing gaming views on up to three displays, and compatibility with ATI stream technology, this new PCS+ HD5830 accelerates the daily application in less time and with minimal effort to maximum the working and entertaining productivity.